It's funny - it's my personal blog, so I can do whatever I want with it, yet I'm not quite sure what it will be this year. Is it a family blog to keep people updated or preserve memories for the future? Is it a journalling blog, where I ramble and meander from topic to topic, wherever the wind blows? Is it a testimony blog? A homemaking/marriage/parenting blog? Meh, I don't know. I'm having an identity crisis. I think that paralyzed me last year too. But what I DO know, is that writing is good for me. I've always said that you can judge my mental health by the state of my house (if it's tidy and neat, that means I'm feeling strong, if it's a disaster, that means something's wrong), and that's true to an extent about writing. If I'm writing regularly, it means that I'm making time for myself (not in that New-Agey, Oprahesque "me, me, me" way, but in a forcing myself to be contemplative and reflective). So, I'm going to worry less about content and output, and focus more on the process. This blog will be eclectic. Somedays it'll be family-oriented, somedays it might be about organization or parenting. I'm sure I'll share a recipe or two. Hopefully I'll talk lots about where I'm at in my reading. I want to make sure I discuss whatever spiritual insights have caught me for the week. At the end of the day, though, what's most important is that I just sit down and DO it. I'm not going to use the "I" word (can you guess it? ), because it's all over blogs during this time of year and it's just too precious for me. But I am going to use the word Responsible. I'm in control of ME, within the confines of my human world. So, if I say I'm going to write more, than, with the help of God, I'm going to do just that. Are you getting the sense that this is about more than just this little blog? Right you are. I don't want to be grandiose and egocentric with all this predictable talk about resolutions and the like. But, certainly the novelty of a new calendar leads one to be reflective and think about the big stuff in life. 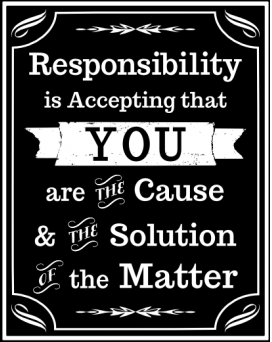 Responsibility is going to be a big theme for me from here on out.